3. Steady improvement, as of a society or civilization. I love a good "Before" and "After" post with lots of photos. But some of us take longer to accomplish those "Afters." Sometimes it's laziness, lack of funds, or days filled with work and activities. Sometimes it's just not knowing exactly which direction to take so you can get to the "After" shot. That's why I'm hosting the "Show Me the Progress" Party on March 10th. 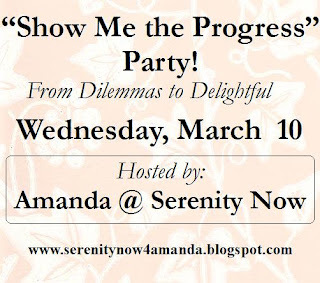 It's going to be a time to celebrate the little steps you're taking to improve those Dilemmas you've been linking up with here at Serenity Now. Remember...you don't have to have a complete, finished Delightful "After" photo to link up. If you have incredible "Before" and "Afters," then please, by all means, link up and inspire some bloggers! But if you've been taking your time, for whatever reason, then please share your Progress with us. Progress can be anything as small as listing the ideas from Decorating Dilemmas comments you received that you really liked and want to implement. Or, tell us your plan for your Dilemma and show us a photo of the supplies you're planning on using. Halfway done with the transformation? That's okay...we want to see and be encouraged! If you're new to the blog or haven't linked up a Decorating Dilemma before, then you can take some time to share progress you're making in any area of your life at home. Have you been more consistent with your Meal Planning? Have you started a work out routine? Have you read any books on your 2010 "must-read" list? We all know that it's one thing to link up a Decorating Dilemma and let the advice start rolling in. It's another thing entirely to work with the feedback you've been given and push yourself towards a goal. I was really inspired by the comments I received on my January post, and I've been making some plans for my Family room. I actually have some Progress to share with you all, based on the comments. I am so excited to show you what I've been working on and where I'm going with the room! There will be a SMALL Giveaway contest for the party participants. I hope you'll go back through your posts or look through your home and find a small area you've made some Progress in this winter! I need so much help in the decorating department, it's crazy! Sadly, all I have are "befores" there. But I do have some P90X before and afters... well, the real "after" will be in about two weeks. YIKES! Oh I am linking up...just wait until you see how much I have halfway done everything hahaha! Are you going to be doing another Decorating Dilemmas Party soon? I'm ready with photos when you do! I love the idea of celebrating the progress! Sometimes it takes me a long, long time to make it from "Before" to "After." It's nice to think of advancing toward a goal being something worth noting! i am sooooooo ready for the progress party. remember my brown tv room/keeping room? well, it's still brown but i have made some changes! i better take the pictures now before it gets dirty, again! Yeah! Another party! I might not have anything finished to show (I'm hoping to) but I definitely will have some progress pictures. It will be fun to see what everyone has accomplished. Will preschool do make-up days? It only seems fair that you do since you paid for the time that Natalie was to be there. I am super excited for this party! Sounds like a great party!! I will bring the dip and chips!! LOL! I haven't really done much to my bedroom since I posted on one of your dilemma parties a couple of months ago. Maybe I can get something done soon so I can share some progress! Woo hoo! I love it! I'll definitely be there! Motivation to get busy on my patio, thanks! Yesss I can't wait! I hate that I missed the last dilemma party - I've been overwhelmed with "durings!!" your body systems that have to attune different metabolic, circulatory and gastrointestinal processes in between relatively short periods of time.